Block Sandy ღCoffee Addict Booksღ? This will prevent Sandy ღCoffee Addict Booksღ from sending you messages, friend request or from viewing your profile. They will not be notified. Comments on discussion boards from them will be hidden by default. 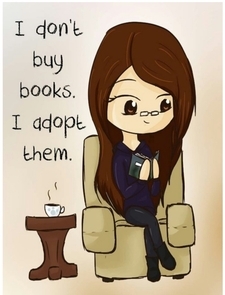 Sign in to Goodreads to learn more about Sandy ღCoffee Addict Booksღ. We’d love your help. Let us know what’s wrong with this preview of The Chateau by Tiffany Reisz. This one is full of sass and funny moments. Kept me entertained throughout! I'm totally doing the happy dance now! WOW!!! This book is the very definition of falling in LOVE. This book I'm totally doing the happy dance now! This book just made everything in the world right for a while. I had a smile stuck to my face all the while reading this gem. It was fun, witty and downright romantic. Rarely you get to see a slow and steady development of a relationship of this proportion. I never knew I could enjoy a slow burn romance this much that I never wanted their story to end. The only downside is the copious amount of inner monologue Vanessa was having throughout the book. 600+ pages was bit too much for this one. If there were more dialogues and fewer monologues I would've rated it higher. That being said, The Wall of Winnipeg and Me will go down as one of the best romance novels of our time. This book was a pleasant surprise! Being her first book Ms. Young captives her readers into the world of warriors, where blood, loyalty, and survival are the ethical bases of their tribe. Sky in the Deep is a well-written and a well-balanced story with rich description, complex characters, strong emotional connections, violence, and deep-rooted morals. This story takes us on the journey of young Aska girl , Eelyn who was groomed her entire life to be a ruthless warrior. Losing her brother Iri, in the battle against theRiki tribe five years ago, she is more than determined to kill any Riki she comes across in the battlefield. Now, In the middle of a bloody war, she sees the ghost of her brother and starts chasing him. This chase leads her to discover the truth of her brother, not only is he alive but she is baffled to find out Iri is now a Riki, her sworn enemy. Being captured, broken, betrayed and away from home, Eelyn’s life will be thrown out of its axis once she becomes a slave to Iri’s adopted Riki family. She is stuck between love for her brother and his betrayal to her clan. What follows once Eelyn becomes a prisoner living with the enemy is the heart and soul of this story. This is where the author shines as a storyteller. “I could still see a young Eelyn standing on the beach turned into the wind, a sword in one hand and an axe in the other. Ms. Young seamlessly captures the struggle of Eelyn throughout the story. I wish the ending wasn’t as rushed. I wanted a different perspective of the story as we a have primary characters from rival clans keeping their hatred aside and uniting for a good cause. Overall, it was quick and a compelling story. The author has created something magical here!! Transcendence is an incredible love story taking place in a pre-historic era. It is a story of survival, unfathomable love and a strong emotional connection between two people from a different period of time. Edh is a lone survivor of a forest fire wiping off his entire tribe. He barely survives in a cave with almost no human contact, harsh winter and diminishing food force. He is suddenly startled by a noise coming from the pit he dug to trap animals. Once he reaches the source of the sound, he finds a female with strange clothes and making a lot of noises with her mouth. Deciding she should be his mate, he carries her to his cave and starts tending to her needs. ‘Elizabeth’ or ‘Beh’ is traveled way back in time. She is confused to be in presence of a caveman, the only human being she comes across but he can hardly understand anything she says. Ehd finds his mate to be strange, unlike any women from his tribe. She gives him a constant headache with the noises she makes. However, he is determined to prove to her that he is a capable mate and wants her to like him. The inevitable misunderstanding between them due to lack of communication was hilarious and cute at times. Ehd's constant need to put a baby in Beh was something that never ceased to put a smile on my face. The story was told from Ehd point of view giving an insight into his innocent thoughts, raw desire and tangible emotions making you fall in luffs with him too. I wished we had few chapters for Beh’s pov, I really wanted to hear her thoughts but then I think the author was trying to show the unconditional love of Edh which goes beyond words. The whole point of this story was to experience the feeling of love that transcends time and language. We’d love your help. Let us know what’s wrong with this preview of Transcendence by Shay Savage. Simple, beautiful and feel good love story. Mia Sheridan’s writing has evolved so much over time but you can still see the immense writing talent in her initial books. Her characters shine throughout making you fall for them with an ease. Nobody writ Simple, beautiful and feel good love story. Mia Sheridan’s writing has evolved so much over time but you can still see the immense writing talent in her initial books. Her characters shine throughout making you fall for them with an ease. Nobody writes star-crossed lovers like she does and her storytelling ability is like a warm sunny day. You just want to soak it all in. Pretty much everyone acted silly and immature expect Nate. The action and the consequences made no sense to me. Like for instance A) (view spoiler)[I never got to know why Daisy went to the Lake in the first place? (hide spoiler)] Also, B) (view spoiler)[Swayze for the better part of the story was adamant in finding more about Daisy’s death via hypnosis and she lost Griffin over it, in fact, nobody was happy about it. Turns out all this was for nothing as Doug was murdered (so unrealistic) and Nate asked the psychiatrist to lie about her hypnosis? (hide spoiler)] So, if my calculation is right the 85% of the story was nothing but a filler then? And C) (view spoiler)[ I still couldn’t get over the fact Griffin left her. He wanted to move to a different city to keep her safe but when she refuses to go with him, he left anyway, why? His family was here, he wanted to leave for her safety and he just uprooted himself for what purpose?! Just to get away from her? (hide spoiler)] This book has multiple POV, in some chapters we didn’t know whose thoughts I’m listening to until I was on page two or three. I would say this book is still work in progress and feels incomplete. We’d love your help. Let us know what’s wrong with this preview of The Boy & His Ribbon by Pepper Winters. Whoa! This book right here is a fine example of a story with twisted fate, complicated emotions, irony and soul-crushing love! Jewel E. Ann is a master storyteller, there wasn’t a second while reading this book I felt bored or distracted. Her words sucked me in and I was transported to a different world of Nate – a single parent, widower whose once perfect world was ripped apart TWICE and Swayze – who is trying to adjust to a life of new found love with a perfect specimen of boyfriend Griffin, while struggling to understand her undeniable connection to Nate’s past. “I can’t stop thinking of this. It’s a song that loops in my head. It’s a movie I want to watch until I have every scene-every line-memorized. It’s my favorite book where all the words have been read and reread in search of something new, something more. Transcend in my opinion, was fresh and unique, with an engaging storyline and unpredictable outcomes. Everything about this book was perfectly done. Every lead character was given a depth to them, the story weaving between the past and present gave a much-needed insight into their connection. The writing was brilliant with a touch of humor, every chapter brought out that awe element you need to keep begging for more. Take my advice and go in blind, you do not want to miss this ride. Okay not blind, at least reading blurb would suffice, I’m sure no one can resist a story with a single dad *winks*. However, Cliff-hanger ALERT!! Now, if you’ll excuse me I have to go question my belief in life after death!? Roses are red. Violets are blue. I’m using my hand But I’m thinking of you. Sandy ღCoffee Addict Booksღ read 26 books of her goal of 25! Sandy ღCoffee Addict Booksღ read 30 books of her goal of 30! Sandy ღCoffee Addict Booksღ read 51 books of her goal of 50! Sandy ღCoffee Addict Booksღ read 96 books of her goal of 95! Sandy ღCoffee Addict Booksღ read 136 books of her goal of 100! Take a look at Sandy ღCoffee Addict Booksღ’s Year in Books. The good, the bad, the long, the short—it’s all here.